Edelbrock is excited to announce the release of their E-Force Supercharger system for 2005-09 Ford Mustangs equipped with a 4.6L 3V. This all-new design is engineered and manufactured by Edelbrock and features an Eaton® Twin Vortices Series (TVS®) GEN VI rotor assembly - the same internals used on the new Corvette ZR-1. This combination improves 2005-2009 4.6L 3-valve Mustangs to an impressive 466 horsepower and 439 ft./lbs. of torque on only five (5) pounds of boost; this is more power per psi than any Mustang supercharger system on the market today. The supercharger assembly is integrated into Edelbrock's unique intake manifold for a truly seamless design with minimal components. The intake features 15" long runners for maximum low-end torque and an integrated bypass valve that helps reduce parasitic loss under light throttle, which improves mileage potential. Keeping the air cool is a 110 square inch high capacity air to water intercooler - the largest of its kind available on the market today - and dual core low temp heat exchange. This Edelbrock E-Force supercharger assembly includes a matching set of coil covers uniquely styled to give your engine compartment a custom look. 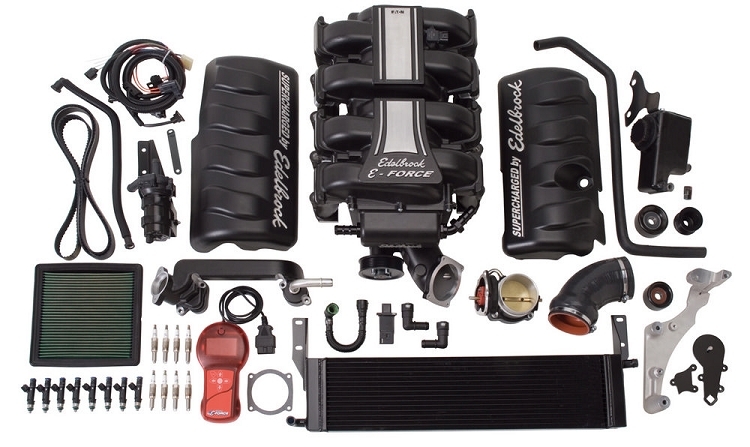 This complete Edelbrock E-Force supercharger kit includes everything you need to bolt it on under the hood of a 2005-2009 Mustang 4.6L 3V, including supercharger/manifold assembly, air inlet with 85mm throttle body, fuel injectors, air-to-water intercooler, spark plugs, coil covers and handheld flash programmer to properly tune the factory ECU for the added power. Edelbrock offers an available 3-Year/36,000 mile warranty and 50-State emissions legal. This is a 50-State street legal kit EO #D-215-72 for 2005-09 Ford Mustang GT's. The most efficient system available - 466 HP and 439 ft./lbs of Torque on only 5 lbs. of boost!